JUDE/Professional 5.3 Beta has been released! JUDE has been provided the reference function of JUDE API. And now, you can edit class diagrams, usecase diagrams, ER diagrams and Mind Maps by using edit function of JUDE API since JUDE/Professional 5.3 Beta. You can find detailed information about JUDE API in the JUDE install folder\api\doc\index.html. As a sample program of JUDE API, DB Reverse Tool is included in it. Let's try! 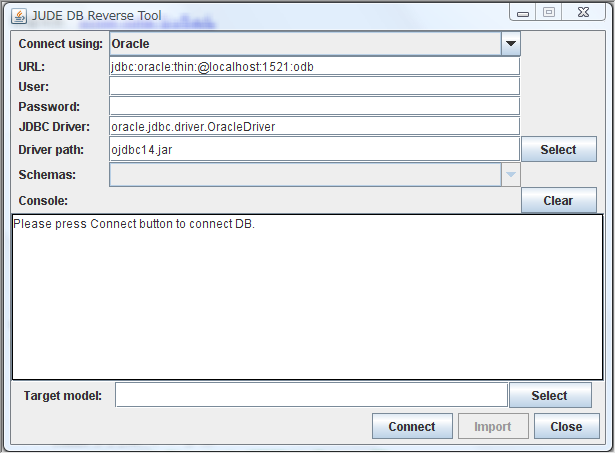 DB Reverse Tool is included as a sample application of JUDE API in the JUDE install folder. This application employs the edit function of JUDE API for ER diagrams. You can import table definitions of your DB system into JUDE ER models, then create ER diagrams in JUDE/Professional 5.3 Beta. Please see db_reverse-e.html under the JUDE install folder for details.